Mexico upset tournament favorites Germany in a game that was as tactically interesting as it was viscerally exciting. Joachim Löw’s Germany set up in their anticipated 4-2-3-1, though with Marvin Plattenhardt replacing Jonas Hector in the team’s acknowledged weakest link at left back (Julian Draxler was chosen ahead of Marco Reus in the contested left wing spot). Juan Carlos Osorio, however, opted for an unexpected 4-2-3-1 rarely used in Mexico’s qualifying campaign. While none of the starters were exactly unexpected, Miguel Layún played at right wing rather than at left back, with Carlos Vela moving inside to play underneath Javier Hernández. Löw and Osorio are temperamentally quite different coaches, and this game illustrated the difference. Löw is committed to a process of development, which means that his teams tend to evolve gradually over the course of a tournament rather than in reactive decisions to the immediate game. As a result, he tends to stay committed to players and plans. That doesn’t mean that his approach is necessarily conservative; this is the coach who won the Confederations Cup last year with a team of youngsters. But it’s notable that Löw for the most part only brought youngsters to that tournament, leaving himself no Plan B. Whether his approach is conservative or radical, Löw is likely to give it a chance to play out, at least within an individual game. Osorio, by contrast, has been criticized as overly reactive, with constant player rotation supposedly undermining his team’s stability. In the six friendlies leading up to the World Cup, Osorio employed 3-4 different formations (depending on how finicky you get about distinguishing 4-3-3 and 4-1-4-1) and 30 different starters. Nor is this merely a matter of experimentation in non-competetive matches. In the four World cup qualifiers in September and October, Osorio used three different formations and 24 different starters, only 3 of whom started in three of the games (none started all four). It would be difficult, however, to argue that Osorio’s game plan against Germany was not spot-on. That plan had three critical components. First, Vela was responsible for man-marking Toni Kroos despite his ostensibly attacking role and indifferent defensive reputation. 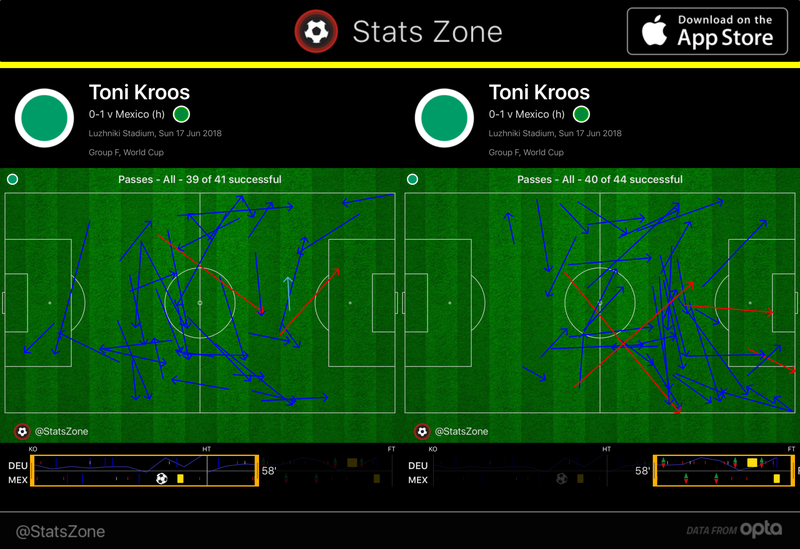 It would be wrong to say that Vela shut down Kroos, who was the game’s most prolific passer (with a 93% completion rate to boot), but the rate and positioning of Kroos’s passing gives a sense of Vela’s impact. Kroos actually completed one more pass in the 32’+4′ minutes after Vela was subbed off than in the 58’+2′ he was on–and from much more threatening positions. While some of the difference in positioning could be attributed to other changes as the game wound down and Mexico shifted to a more defensive posture, Vela’s role in holding Kroos at bay should not be underestimated. Without Kroos in a good position to help break down Mexico’s defense, Germany struggled to a surprising degree. Second, Hirving Lozano was ideally suited to attacking the space down the left flank created by Joshua Kimmich’s attacking forays. Lozano is probably the most exciting player on the Mexican team, with the pace and stamina needed to support left back Jesús Gallardo defensively while still springing forward to serve as the main engine of Mexico’s counter-attack. While a surprising proportion of Mexico’s counter-attack started up the middle (of which, more in a moment), the ball usually ended up on the left precisely because Lozano was able to exploit the space created by Kimmich’s attacking forays. The last defender on the goal scored by Lozano was actually Mesut Özil, who was visibly frustrated that he was being forced into a role for which he was so clearly unsuited. Third, Javier Hernández was consistently stationed as far up the pitch as possible, his only defensive duty to serve as an immediate outlet for the Mexican counter-attack. This forced Germany to choose between adopting a more defensive posture or leaving themselves open to that persistent threat, and Löw’s men clearly chose the latter. Given how often Hernández is described as just a poacher or ineffective when not paired with a target man that can hold up the ball, it’s worth underlining how effective he was in this solo role. Though he did not “trouble” Germany’s center backs in the way a Diego Costa is said to, he consistently retained the ball and made good decisions about when and to whom to pass as well as when to find space for his own run. Germany, for their part, remained true to their principles of a high-possession, full-team attack. Their 4-2-3-1 often looked in practice more like a 3-6-1 or even a 2-3-4-1, with Kroos playing slightly ahead of the center-backs positioned at the midline while Sami Khedira and the fullbacks all pushed up into the attack. Khedira was the most surprising part of this approach. While Kimmich may have left a space in need of defending, he was also a clear contributor to Germany’s attack. Perhaps Khedira felt compelled to move forward because of the distribution void created by Vela’s marking of Kroos, but that is a role in which Khedira was never likely to succeed. The other notably ineffective aspect of Germany’s attack was striker Timo Werner, who after a threatening chance at 3′ off a penetrating pass from Kimmich largely disappeared between Mexico’s center-backs, starved of service. Near the end of the first half, Germany briefly switched to a 4-3-3 with Werner out right and Thomas Müller (and briefly even Özil) up top (Draxler shifting inside to the midfield triangle). This strikerless attack seemed promising, and the added midfield support of a false nine might have allowed Khedira or a replacement to concentrate on thwarting Mexico’s counter-attack. But Löw returned to his original line-up at the start of the second half and the balance of play remained largely unchanged. As the second half progressed, Löw doubled down on his original plan, while Osorio gradually shifted his side to a more defensive stance. Osorio was the first to act, moving Héctor Herrera forward to take over Vela’s position and bringing in Edson Álvarez, a defender, to take over the holding role. Löw responded by bringing in Marco Reus for Khedira as a central midfielder and dropping Özil into a deeper role alongside Kroos. In addition, Jérôme Boateng increasingly advanced into Mexico’s half as yet another deep-lying distributor. This definitely helped Germany’s control while in possession, but left Hummels alone to deal with Hernández and did not reduce Mexico’s threat on the counter-attack. The next major change in the game came right before the 75th minute, when Osorio brought in Rafa Marquez (making him only the 3rd player to play in 5 World Cups and the only one to do so as a captain) and moved Álvarez to right wing back in a 5-4-1. 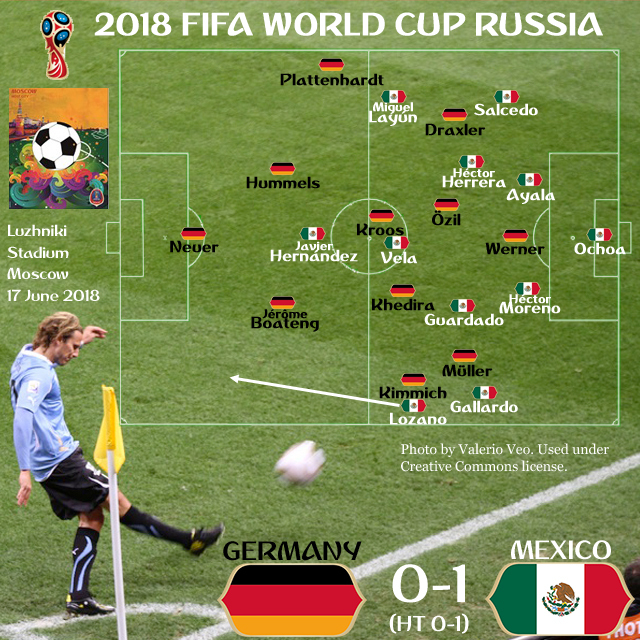 Löw responded by bringing on Mario Gomez for Plattenhardt so that his team became a 3-4-1-2 with Kimmich actually dropping back into a more defensive position and Reus playing beneath Werner and Gomez, the rest of the midfield setting up an attacking perimeter around Mexico’s box. Finally, with less than 5′ left in regulation, Löw brought on Julian Brandt for Werner, and his fresh legs and genuine wing play on the left had an immediate effect. He created Germany’s best chance late in the game with a sharp vertical pass for Reus at the left post that led to chances for Reus, Gomez, and eventually (via Kimmich) for Brandt himself. While the tired legs around him surely played some role in Brandt’s impact, one wonders whether an earlier substitution might not have given Germany a better chance of turning things around. Löw’s goal, of course, is not to win one game but to win a World Cup. It is less important for Germany how they perform in the group stage, provided they advance, than what they learn and how that shapes the team heading into the knockout stage. Likewise, Osorio’s success in this game will matter very little if Mexico does not advance from the group, and the game plan he deployed in this game is unlikely to work against either Sweden or South Korea. Nonetheless, Mexico have put themselves in a position that could allow them to win the group and avoid a Round of 16 meeting with Brazil–assuming, of course, that Brazil’s tie with Switzerland doesn’t keep them from topping Group E.
Michael Cox in The Independent. I don’t think that it was simply the tactic….honestly, it was painful to watch Kroos leisurely jog back in the own half while Mexica was in the middle of a counter attack with a “oh, I won’t be there in time anyway” attitude. Yes, Kimmich was supposed to be attack, but he is ALSO a defender and how often was the 22 standing completely free with Kimmich no-where to be seen even in situations in which the majority of both teams were in the German half? And then there was Plattenhardt, who nearly created an own goal (thank god for Neuer), and then was too timid to actually launch an attack, which lead to the other German players not involving him anymore, making them woefully ineffective on the left and allowing Mexico to focus their attention on the other flank. (Last time I saw a situation like this in the game Germany vs Algeria in 2014, back then it was Mustafi, which was exactly why Germany only started to be a danger after Mustafi hurt himself and his position was substituted by Lahm). And there was just on overall sense of commitment from most of the players, especially the defensive midfield. I mean, Özil gets a lot of sh… for not preventing the goal and being supposedly ineffective, but he at least was THERE and that is NOT HIS freaking job, being an attacking player. He run the extra-mile, but most of the other players didn’t. Not to mention that they gave away the ball way too easily and rarely bothered to truly challenge the Mexican players. I haven’t seen them play that badly since the game against Croatia in 2008. And there is NO excuse for this with so much quality in the team. Something is off, they are just not working for each other and are unwilling to take the extra step. I agree that Germany played poorly. They looked not unlike previous World Champions, content rather than hungry. And I agree 100% about Özil. At least he got back. I’d like to see Gundogan and/or Goretka given a chance in midfield, though I wouldn’t give up on Kroos just yet. There’s a lot of games still to come. Goretzka. Because he does KILLER free kicks. In any case, they need to replace Khedira. And maybe Löw should consider putting Müller in the middle instead of either of the “strikers”. Because against Sweden, there won’t be room for a striker, they will need someone who can finagle his way through small spaces. This is Müller’s true talent, not hit abilities to assist. There are others who can pass more precise.